The idea actually came to me while I was piping roses onto this cake using I Am Baker's rose cake method - I had already made a few rose cakes before and suddenly thought to myself, I should cover a cake with Hello Kitty in the same way! The only thing I couldn't decide was if I wanted the kitties to be staggered (like with the rose cakes), or in neat rows. I decided to go with the neat rows. I wanted the cake portion to be pink, so I made an ombre vanilla cake with varying shades of pink. Once the cake was baked and cooled, I started on the filling. I decided to do a decadent chocolate ganache, so I simply heated some heavy cream and then poured it over my dark chocolate, waited for the heat to melt it, and then stirred it up until the chocolate became smooth and glossy. Once the ganache came to room temperature, I whipped it until it became fluffy and light, and then piped it in between my layers of pink cake. As for the frosting, lately my go-to frosting has been a cream cheese cheese buttercream, but I have really been wanting to try making swiss meringue buttercream, which I tried out for the first time! The frosting was definitely more complicated to make than a regular buttercream, because you have to heat egg whites and sugar to a certain temperature, and then whip them into a meringue. Then you add butter a chunk at a time, until it comes together into a beautiful glossy buttercream. But the extra effort was worth it, because it came out so silky and smooth, and wasn't too sweet at all. I tasted the frosting right before I frosted the cake, and I was so excited because it tasted like whipped cream! And it was so easy to work with because it was so light and fluffy and smooth. So I did a quick crumb coat over the entire cake, and then a second coat as well. And then came the fun part - piping Hello Kitty! I piped her the same way I do on my Hello Kitty cupcakes and mini cupcakes (my favorite thing to pipe on cupcakes), except this time I piped her on the sides of the cake. First I piped the Hello Kitty heads all the way around the cake, so that they would be evenly distributed along the sides. Next I piped the ears with a leaf tip. At this point it didn't look like much, until I brought her to life by adding the eyes, whiskers, bow, and nose. And the final Hello Kitty count - 56 of them! And it was so much fun to do! 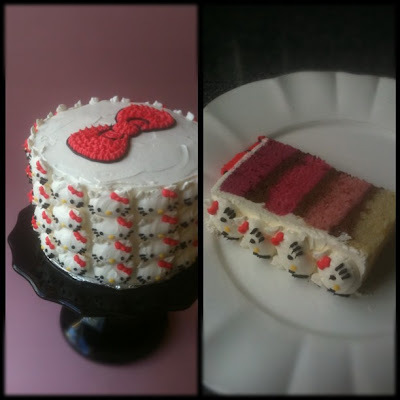 As for the top of the cake, my inspiration for the bow came from this Hello Kitty cake that I had made for my daughter (which I also later made again for a bridal shower). My favorite part about the cake was the bow, so I decided to pipe that same bow onto this cake as well. When the cake was finally done, I was seriously giddy. It was my dream birthday cake. A ton of Hello Kitty, her cute little bow on top, and served on top of my brand new Rosanna rococo noir cake stand! Wheeeee! Later on when we ate the cake, the frosting was still silky but didn't have the same 'whipped cream' taste. Perhaps because it had hardened in the fridge, or because smoothing it on the cake made it more compact, but it had a much more buttery taste than when it was freshly whipped. Also I missed that cream cheese 'tang' from my favorite cream cheese buttercream, so I've been eyeing this swiss meringue cream cheese frosting at 6 Bittersweets to try out next time! I was so excited about this cake that I posted it on Instagram as well! In the end, I just couldn't bear to eat the Hello Kittys. So I saved them for my kids to eat - they had no problems digging right in! You can now find my recipe for Pink Ombre Hello Kitty Cake in my new book, "The Hello Kitty Baking Book"! Enjoy! I envy this cake so much! So delicious and cute. I love this! Happy Birthday! This is so cute!! great job and great design idea! So absolutely perfect - inside and out! Thank you for sharing! this looks amazing! you are talented! usually swiss meringue buttercream tastes buttery when it's not brought back to room temperature. if you kept the cake in the fridge before eating it, it hardens and doesn't have that silky taste. usually take it out a few hours before the expected eating time and it'll be delicious again! @Anonymous - ahh ... good to know. i took it out of the fridge about 30 mins before we cut into it, maybe i should have left it out for longer! You are insane. This takes so much talent-- you are gloriously gifted! This is boggling my mind, how you wrote about it with such ease. It would take me somewhere near four years to even figure out how to get those perfectly round, different colored layers. FABULOUS. :D You have some very lucky children! @Sara - haha, yes i am insane ... for hello kitty! :) my kids are funny though, they only eat frosting and not cake! thanks for the lovely comments! I love the brown chocolate in between the layers of pink ombre. And the Hello Kitty's pretty awesome too. Happy Birthday! Ok, wait..THIS IS AWESOME!!! 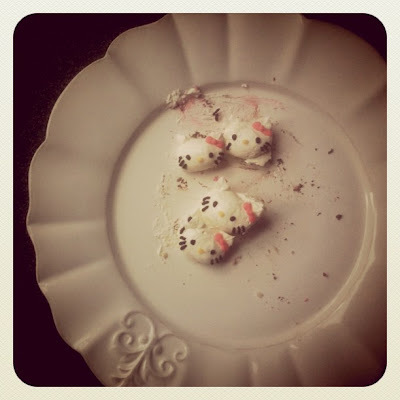 Im so gonna make this!!! Would you agree if re do the same and mention you??? Secondly, this cake is so much fun! When I first looked at it I thought you'd bought all the Hello Kitty faces and just stuck them on to your cake. But piping them all? That is seriously impressive! thanks @MandyM! yes i piped them all, guess i had lots of practice from piping them onto cupcakes! :) glad you enjoyed the post! @jugglingwithjulia.com - awww, thank you! and wow was the cake featured on foodbuzz? i didn't even see it! This is just too freaking darling! It seems like a bit of work but so worth it! Well done! this is not only amazing but also a real work of art! you are such a talented baker, Michele!!! awww, thanks @whathelenworetoday ! so sweet! Please let me know which tip you used to pipe teh HK heads. You are truly talented !! how long did it take to pipe all those hello kitty faces? its so cute.